Vancouver, British Columbia - January 18, 2019 - Fremont Gold Ltd. (FRE: TSX-V; FR2: FSE: USTDF: OTC) (“Fremont” or the “Company”) is pleased to announce that drilling will be underway at the Company’s Gold Bar project by the end of January, with drilling to start at the Gold Canyon project soon thereafter. Fremont’s Gold Bar and Gold Canyon are both past producing gold mines in the Gold Bar District, Eureka County, Nevada. The 1,000-metre reverse circulation drill program at Gold Bar will target a coincident gold and mercury geochemical anomaly that may represent an extension to the historic Gold Bar mine (see Figure 1 and the October 30, 2018, news release). Gold Bar was exploited by Atlas Precious Metals Corp. from 1986-1994 and produced 286,354 ounces of gold (1). The 500-metre diamond drilling program at Gold Canyon will be focused on further defining a previously unrecognized mineralized zone approximately 50 metres below the pit floor (see the July 25, 2018, news release). 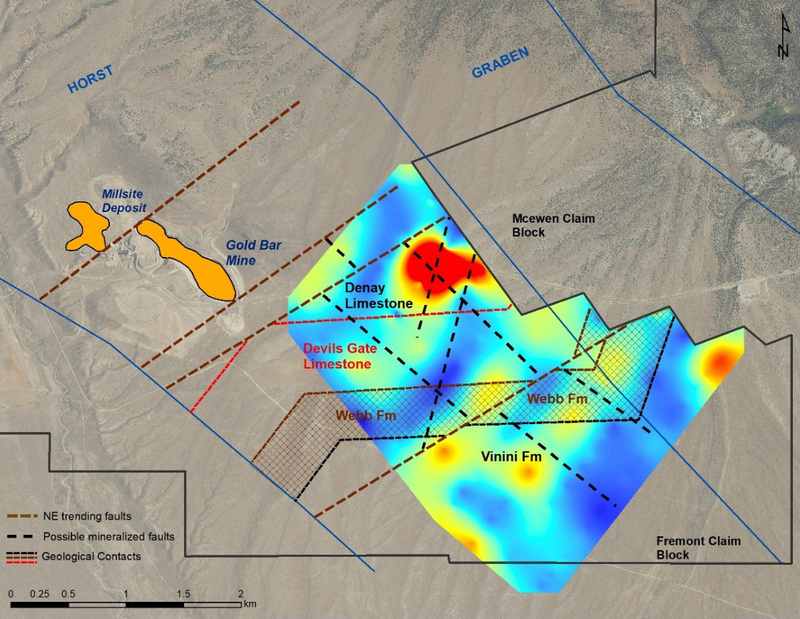 Fremont’s Gold Bar and Gold Canyon projects are both former mines in the Gold Bar District, Eureka County, Nevada, an active mining district within the Battle Mountain-Eureka Trend. The district contains several Carlin-style sediment-hosted gold deposits, including McEwen Mining Inc.’s (“McEwen”) Gold Bar project, which is scheduled to begin production in early 2019. Fremont’s Gold Bar and Gold Canyon projects are adjacent (west) and immediately north of McEwen’s Gold Bar project. While McEwen’s project and Fremont’s project share the same name, the historic Gold Bar mine is held by Fremont. 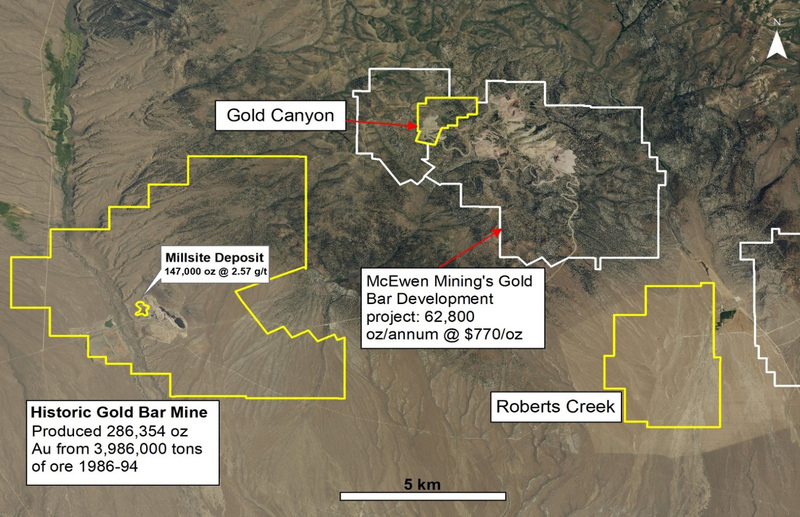 McEwen’s project comprises four of the five satellite pits to the historic Gold Bar mine, whereas Fremont controls the remaining satellite pit, Gold Canyon (see Figure 2). Fremont’s Gold Bar project encompasses the historic Gold Bar mine, which produced 286,354 ounces of gold from 1986 to 1994 (1), and the Millsite deposit, which hosts a historic resource of 147,000 ounces of gold (1.62 Mt @ 2.57 g/t gold) (1,2). Millsite is believed to be a faulted offset of the historic Gold Bar mine and is located to the northwest of the open pit. Fremont recently completed a soil sampling program based on a new structural interpretation and identified coincident gold and mercury geochemical anomalies to the southeast of the historic Gold Bar mine. This new interpretation and data suggest that gold mineralization related to the historic Gold Bar mine may extend to the southeast. Gold Canyon is adjacent to and directly northwest of McEwen’s project, approximately 800 metres from McEwen’s Gold Ridge deposit. Gold Canyon produced approximately 41,000 ounces of gold from 1990-1994(1) and a stockpile of previously mined ore still exists at site. The content of this news release was reviewed by Dennis Moore, Fremont’s President, a qualified person as defined by National Instrument 43-101. Certain statements and information contained in this press release constitute "forward-looking statements" within the meaning of applicable U.S. securities laws and “forward-looking information” within the meaning of applicable Canadian securities laws, which are referred to collectively as "forward-looking statements". The United States Private Securities Litigation Reform Act of 1995 provides a “safe harbor” for certain forward-looking statements. Forward-looking statements are statements and information regarding possible events, conditions or results of operations that are based upon assumptions about future economic conditions and courses of action. All statements and information other than statements of historical fact may be forward-looking statements. In some cases, forward-looking statements can be identified by the use of words such as “seek”, “expect”, “anticipate”, “budget”, “plan”, “estimate”, “continue”, “forecast”, “intend”, “believe”, “predict”, “potential”, “target”, “may”, “could”, “would”, “might”, “will”, “hope”, “will be”, “expected” and similar words or phrases (including negative variations) suggesting future outcomes or statements regarding an outlook. Forward-looking statements in this and other press releases include but are not limited to statements and information regarding the start of drilling at Gold Bar by the end of January, and Gold Canyon soon thereafter, and the amount and type of drilling. Such forward-looking statements are based on a number of material factors and assumptions and involve known and unknown risks, uncertainties and other factors which may cause actual results, performance or achievements, or industry results, to differ materially from those anticipated in such forward-looking information. You are cautioned not to place undue reliance on forward-looking statements contained in this press release. Actual results and future events could differ materially from those anticipated in such statements. Fremont undertakes no obligation to update or revise any forward-looking statements included in this press release if these beliefs, estimates and opinions or other circumstances should change, except as otherwise required by applicable law.